This tutorial is to show you how to enable PPTP VPN feature on Fortigate devices running FortiOS 4.0+. After upgrading your Fortibox to the OS 4.0, the theme color changed (too visual, right), and the VPN PPTP for clients is gone. There is no PPTP option in the VPN section (GUI interface). This is what you don’t want because there are so many existing remote users who need PPTP VPN to connect to work. With PPTP, Windows users, Linux users, and MacOS users could easily create a VPN connections and connect to the corporate network. To enable PPTP VPN on Fortigate OS 4.0, you must enable it using CLI (Command line interface). CLI connection to a Fortigate device could be established by Serial Port, Telnet, or SSH. Telnet is less secure than SSH because Telnet is sending everything in plain text, even your password. To successfully connect to VPN using PPTP, end users must have a valid credentials (username and password). The account could be on local Fortigate database or Active Directory. In this tutorial, I assume that you are going to use local user database to authenticate VPN users. 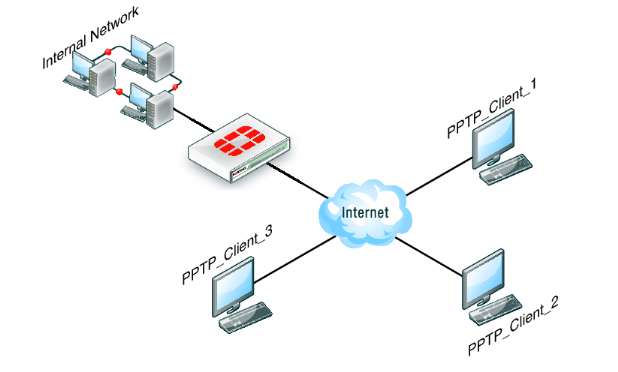 “sip” and “eip” are the IP range of LOCAL NETWORK that you want to assign to PPTP VPN clients. set ip-mode range is to tell Fortinet to use the sip and eip defined above. set usrgrp VPN-Users – Here is what we configured above. The group name VPN-Users we just created is added to PPTP VPN settings. vpn_client01, as a VPN-Clients group member, is now able to connect to the box using PPTP VPN. Now, your box is ready to accept PPTP requests from client, but you need to remember to add this range-ip to Policy because without this you can connect to PPTP VPN but you cannot access any ip inside the network. And if you want to try if PPTP works, you can enable “L2TP/PPTP/PPPoE service event” in Log&Report->Log Config->Log Setting and see what happen in Log&Report->Log & Archive Access -> Event Log when you try to access from a client.